September Girls is a stunning coming-of-age novel about first loves, oblivious parents, sibling rivalries—and mermaids. This imaginative and painfully honest book garnered five starred reviews, including one from ALA Booklist that proclaimed it "a rare and lovely novel, deserving of attention from discriminating readers." Whisked away by his father to an unusual beach town in the Outer Banks, Sam finds himself having the summer vacation most guys dream of. He's surrounded by beautiful blonde girls, and, better yet, they all seem inexplicably attracted to him. But there's definitely something strange about the Girls. They only wear flats because heels make their feet bleed. They never go swimming in the water. And they all want something from him. Sam falls for one of the Girls, DeeDee, and begins an unexpected summer romance. But as they get closer, she pulls away without explanation. Sam knows that if he is going to win her back, he'll have to learn the Girls' secret. 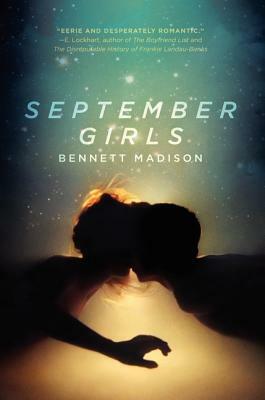 Bennett Madison, critically acclaimed author of The Blonde of the Joke, brings a mix of lyrical writing, psychologically complex characters, and sardonic humor to this young adult novel. September Girls is perfect for fans of the irreverent wit of Ned Vizzini and the seductive magic of fairy tales retold. Bennett Madison is the author of several books for young people, including The Blonde of the Joke. He attended Sarah Lawrence College but remains two classes shy of graduation. He lives in Brooklyn, New York.